Anarchy Is Hyperbole: "No Bone Left Unturned," "Unbroken," and "A Year in Korea." "No Bone Left Unturned," "Unbroken," and "A Year in Korea." When you write the story of a life and career, there are several ways to organize the book. The most common tactic is to focus on a single active moment of drama. This is especially the case when it's been a life of drama and intrigue, or a story centered around one single adventure. In Going Rogue, Sarah Palin opens her tale in a carnival. We are given a moment of folksiness to ground us in her projected character, before she will receive the momentous phone call that will propel her to stardom as the Republican candidate for the Vice-Presidency. It's a classic hook: Attention, readers, here's a sample of the exciting things you'll get to read, as long as you make it through the story of my childhood! Persevere! Alternately, the life might be more episodic, and so you predominantly organize into chapters - each chapter is a case file, or a job, or an event. When Oliver Sacks wrote about some of the most interesting people he'd met as a neurologist in The Man Who Mistook His Wife for a Hat, he focused on each case in their turn, even though the reader was still given an impression of the passage of time and the track of Sacks' career. Frequently, people choose to blend these tactics. Bear Grylls' Mud, Sweat, and Tears opens with a moment from later in his career, when he has been badly injured, before turning to an episodic account focusing on his youth, school, and jobs. 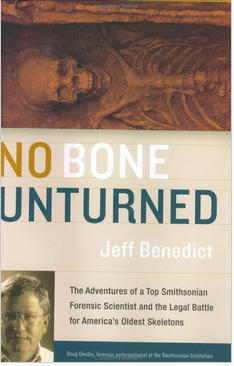 What you should not do is what Jeff Benedict has done in No Bone Left Unturned and move through someone's life in a slavishly chronological fashion. Benedict breaks his story up into irrational chunks. Fully half the book is devoted to a single case, the Kennewick Man. This is the most important case with which the subject, anthropologist Doug Owsley, was ever associated. That fact should indicate to any thoughtful biographer that the book should be organized around this case. It is not. Owsley is called in to investigate some old bones that they've found. He takes a look and makes some notes! There are tool marks, which probably means something. But the next week, he has to file some legal briefs about something else, so we switch to that topic for a few pages. Then it's on to a third case, but it turns out to be nothing, so Owsley does some more work on that first case, with a brief pause while the narrator relates the outcome of that legal brief. Meanwhile Owsley examines the tool marks, and just when he's about to realize something, he has to take a conference call. It goes on in this way, taking an intriguing subject - a forensic anthropologist! - and a fascinating life, and sloshing it sloppily into a series of jags, like a drunk frat boy trying to pour a line of shots. Characters are introduced and described in detail, only to vanish forever into the mists of the ancient realm of Completely Goddamn Irrelevant. But usually the writing is poor and the author's choices are bizarre, which is a shame. I'd bet that Owsley's life would make a fascinating book - this just isn't that book. Is it possible to sue someone for biographical malfeasance? What a pleasure! What a marvel! Laura Hillenbrand's Unbroken is good, and you should read it, and that's all there is to it. It's possible to think of nonfiction in two ways. Sometimes, the actual information is not new or interesting on its own. The interesting part of the book is the way that information is presented and shown to us, tilted and displayed in a wonderful new way. The essays of John Jeremiah Sullivan or David Foster Wallace are of this sort, crafted like a beautiful and ornate vase with looping handles and elaborate swirls. They're a pleasure to see, even if they're only holding water. But other times, the information in work of nonfiction is the real attraction. The job of the writer shouldn't be decoration or elaboration, but simply to get out of the way. Sometimes, this is the harder task. One must provide context and use judgment, but do so voicelessly. To guide without even being seen - that can be the real difficulty. Laura Hillenbrand had a fascinating subject in World War 2 veteran Louis Zamperini. As the book begins, the former Olympic athlete is stranded on a life-raft, the surviving members of his bomber crew around him. A Japanese plane begins strafing their raft. The ocean would be a refuge from the machine gun, but sharks are circling around them, waiting to devour yet another airman. And yet this will not be the climax of the book, but only the midpoint - the eventual extent of Zamperini's adventures would have stretched my credulity if this book wasn't so painstakingly researched. I don't want to provide any further information, because the story itself is such a delightful and doleful series of surprises. Just go out and read it, immediately. David R. Wellens' A Year in Korea: an American Journal is one of the most interesting mystery stories you will ever read. Usually I can figure out the puzzler at the heart of any detective tale, but Wellens managed to write this bit of autobiography with such cunning that I could never answer the central mystery: why would anyone publish this book? David R. Wellens buys a pizza and 1.5 liters of Coke and eats it for dinner. David R. Wellens is ripping his music to his computer. David R. Wellens watched a movie tonight, it was Public Enemies with Johnny Depp and Christian Bale and he thought it was pretty good. David R. Wellens was tired when he woke up this morning, but he drank some coffee. Why? Why is this a book? It is literally just a reproduction of his diary from a year spent teaching at a Korean elementary school, and let me tell you something: David R. Wellens does not lead an interesting life. Here is the whole of the first entry. It is 100% representative of the rest of the book. I worked closely with Miss Kim on this my first day. She needs my syllabi by Tuesday and I am trying to get a handle on the elementary teachers training plan. I started out the day waking up at 4:30 am and reading the teachers handbook before getting picked up by Myoung for a ride to CIFLE (Chungnam Institute of Foreign Language Education). Though I didn’t feel very hungry, I enjoyed a lunch with the Staff of CIFLE at a local restaurant. I sat opposite Lexi, a teacher from Jacksonville. I talked of Anthroposophy and other educational ideas. At the computer in the media room, I typed a plan for an essay that got erased when I tried to save it in a file. I had to get it done again. I worked with Miss Kim, my supervisor, until 8:10 pm (overtime) and she ordered a Korean dinner we enjoyed with the security guard. Miss Kim called me a cab when I finished the essay “Cultural Lessons—The Korean Experience in America” about the experiences of my Korean aunts and uncles who managed to make their lives in the USA. I didn't change that. That's all of it - and that's pretty much all of the book. David R. Wellens and I have many things in common. We're both from Clearwater, Florida. We were both English majors. And we both went to teach elementary school in Korea. I feel like I have a kinship with David R. Wellens. And so I kept waiting for the punchline - the moment when the book/diary/slug would take a surprising turn. I knew it would happen: David R. Wellens will go on the local news, get discovered by a talent agent, and be catapulted to stardom! David R. Wellens is walking out of Paris Baguette when he sees a masked man run by, and he captures this fleeing bank robber with a barrage of doughnuts! David R. Wellens is ironing his shirts, as he describes doing every week, when a jolt of electricity races through him, sparking a new personality that calls itself Susanna! But it never happens. I spent a considerable amount of time trying to find hidden clues or patterns, looking for acrostics or a disguised rhyme scheme. There was nothing - only a vague sense of depression. David R. Wellens does not have a joyful life. He has a weird fixation on pearls, and doesn't seem to deal with women very well - he frequently writes about how he tries to give expensive gifts to female coworkers. This may explain why he is quietly fired from his job, near the end of the book. He often drops the names of the books he's read and loves (Joyce, Flaubert, etc. ), yet his diary is about as complex as that of a child. David R. Wellens is an enigma. David R. Wellens is a also startling failure at most of his goals, and this ongoing pattern made his diary faintly depressing. He intends to save money, but keeps buying expensive computer equipment, and so he saves very little beyond his severance pay. He plans to go to Cambridge for an M.A. in English, then later plans to go to M.I.T. for computer science, but soon lets these goals slip away, unremarked and unlamented. English is the official international language and the importance of the English language is increasing every day. No. There is not an official international language. Even the U.N. has no fewer than six official languages. It gives so much information and such a candid look at what I experienced while teaching in Korea for a year that anyone considering English teaching in Korea can take less of the guess work out of trying to anticipate whether or not teaching overseas is something the reader would want to do. In the introduction to your book as an English teacher, why wouldn't you go to the effort to use all your idioms correctly? What is "bibimpap"? What is Paris Baguette like? That might be the sort of information you'd expect to find in someone's journal of their year in Korea. It's not in this book. Mangled Korean is tossed out without explanation. Information on the day-to-day is the only conceivable reason to read this book, yet it is almost proudly ignored. I picked up my new Korean hambuk. It’s beautiful. I will get more Korean style clothes. Hambuk? David R. Wellens, do you mean hanbok, the traditional Korean garment? I also got a Chilsung Cider from the GS25 store on the way. The lady was wearing a pearl necklace. It seems to mean that she would look after me, like mom or Julia would. What the hell, David R. Wellens? We had a one-day camp today. Susan had prepared laminations. Mrs. Chae delighted me with her bothering Jeff about his shorts—“Do you want my resignation?” asked Jeff over and over again. I wanted to pipe in “yes” for Mrs. Chae. Mrs. Chae, the beautiful creature she is, skipped in her low heeled shoes like a child across the floor. She was happy about something. I was happy to catch a glimpse of her unbridled, joyful playfulness. I don’t think she saw anyone noticing her. I did, though. (She was wearing a string of pearls).